The recent Emergency Powers requested by the President of Liberia are nothing more than her asking for a license to steal. 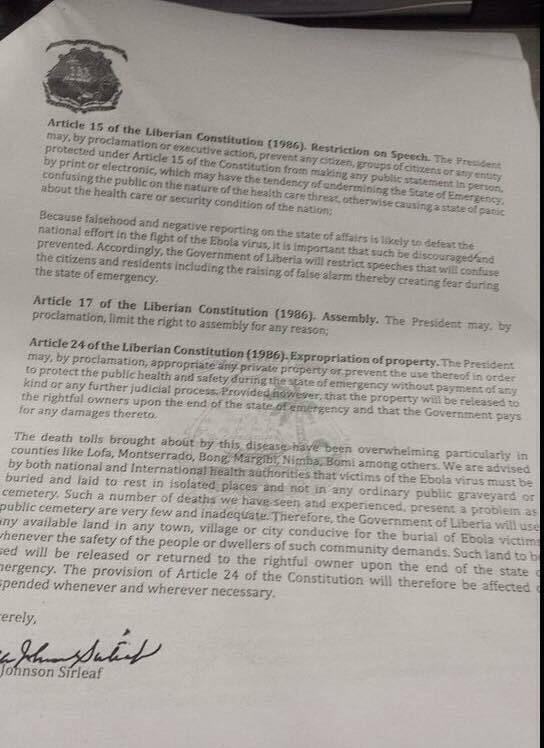 This is nothing more than an attempt, by the president, to dispossess Liberians of their rights and properties and give them no judicial recourse. It is theft. I will deal with only three of the changes the President requested. The President may, by proclamation, appropriate any private property or prevent the use thereof in order to protect the public health and safety during the state of emergency without payment of any kind or any further judicial process. Provided however, that the property will be released to the rightful owners upon the end of the state of emergency and that the government pays for any damages thereto. The President already has the authority to do what she deems necessary under the Public Health Law, as well as the Eminent Domain clause of the Constitution. (iv) that when property taken for public use ceases to be so used, the Republic shall accord the former owner or those entitled to the property through such owner, the right of first refusal to reacquire the property. b) All real property held by a person whose certificate of naturalization has been cancelled shall escheat to the Republic, unless such person shall have a spouse and/or lineal heirs who are Liberian citizens, in which case the real property shall be transferred to them in accordance with the intestacy law. c) The power of the Legislature to provide punishment for treason or other crimes shall not include a deprivation or forfeiture of the right of inheritance, although its enjoyment by the convicted person shall be postponed during a term of imprisonment judicially imposed; provided that if the convicted person has minor children and a spouse, the spouse or next of kin in the order of priority shall administer the same. No punishment shall preclude the inheritance, enjoyment or forfeiture by others entitled thereto of any property which the convicted person at the time of conviction or subsequent thereto may have possessed. The Public Health Law, gives the President the Power to Exercise these powers under EXCEPT for the phrase "without payment of any kind or any further judicial purpose." § 14.5. Right of Minister to commandeer unoccupied real Property and materials. If an outbreak of any formidable epidemic exists or is threatened, it shall be lawful for the Minister to require any person owing or having charge of any land or any buildings or dwellings not occupied, or any person owing or having charge of tents, transport bedding, hospital equipment, drugs, food or any other appliances, materials or other articles urgently required in connection with such outbreak to hand over the use of such land or buildings or to supply or make available any such article, subject to the payment of a reasonable amount as hire or Purchase Price. Any person liable hereunder who without reasonable cause fails or refuses to comply with any such requirement shall be subject to the penalties provided for violation of provisions of this chapter. § 14.2. Power of Minister to make rules. The President can seize (appropriate) ANY private property without payment of any kind of any further judicial process. 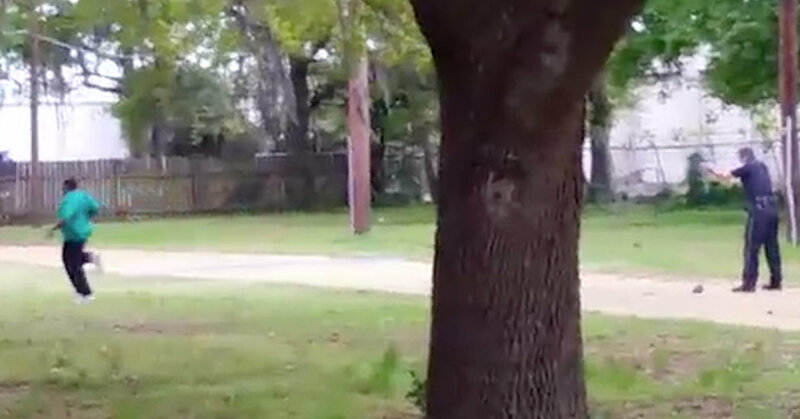 If the citizen in question tries to complain about see #5. One lawyer tried to convince me this is necessary because "the Americans" may demand a specific piece of land for building ETUs and the eminent domain process is too slow and cumbersome. The problem with this logic is that these powers were requested BEFORE the Americans ever came to build ETUs. Secondly why not just streamline the eminent domain process, after all the Constitution does state "PROMPT payment," and there is nothing that stops the government from quickly possessing the property while the "reasonable value" is reached. These people have already identified land/properties they want to appropriate. They will use the state of emergency to appropriate it, and if the citizens complain, see #5. Note: the Richards family has been in court with the government of Liberia for 42 years over an illegal property contract. The problem here is the unspecified "certain labor and services." Can the President by 3 twenty five cent pieces of bubble gum from LeafSir Enterprises of North Carolina for $5,000,000. USD? Yes she can. If a citizen chooses to question it, see #5.
a) Every person shall have the right to freedom of expression, being fully responsible for the abuse thereof. This right shall not be curtailed, restricted or enjoined by government save during an emergency declared in accordance with this Constitution. The Constitution is clear, State of Emergency or not, THERE SHALL BE NO LIMITATION on the Right of the Public to Be INFORMED ABOUT THE GOVERNMENT AND ITS FUNCTIONARIES. So based on what the President is asking for, she can seize (appropriate) any and all property belonging to the family of Flomo Zayzay, WITHOUT payment, and then make a Proclamation that no person associated with these properties can make any statement as to the government's seizure. They will then construct a crematorium on the property, dispose of Ebola waste on the Property, and return it to you after the state of emergency. Or they will seize the properties with homes on them, lease the homes to aid agencies, pocket the money and tell you to see #5. This is the road to perdition! 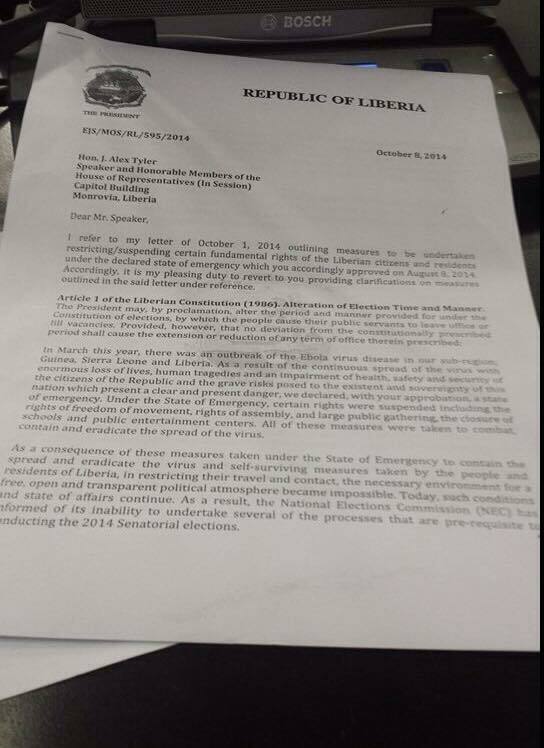 The President of Liberia in a letter, to the House of Representatives, seeking to clarify her earlier request for Emergency Powers, demonstrates how contemptible she is of the people of Liberia. I argued that the President should not be able to seize private property and leave the citizens no ability to have the process reviewed by a court. Secondly the idea that the government alone would decide what the damage would be and what it would pay for is particularly specious. Article 24 of the Liberian Constitution (1986) Expropriation of property. The President may, by proclamation, appropriate any private property of prevent the use thereof in order to protect the public health and safety during the state of emergency without payment of any kind or any further judicial process. Provided however, that the property will be released to the rightful owners upon the end of the state of emergency and that the Government pays for any damages thereto. The death tolls brought about by this disease have been overwhelming particularly in counties like Lofa, Montserrado, Bong, Margibi, Nimba, Bomi and others. We are advised by both national and international health authorities that victims of the Ebola virus must be buried and laid to rest in isolated places and not in any ordinary public graveyard or cemetery. Such a number of deaths we have seen and experienced, present a problem as a public cemetery are very few and inadequate. Therefore the government of Liberia will use any available land in any town, village or city conducive for the burial of Ebola victims whenever the safety of the people or dwellers of such community demands. Such land to be used will be released or returned to the rightful owner upon the end of the state of emergency. 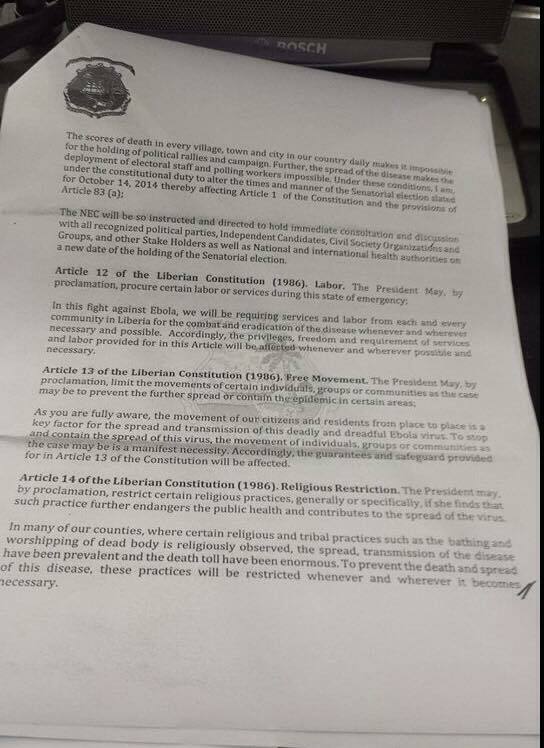 The provision of Article 24 of the Constitution will therefore be affected or suspended whenever and wherever necessary. So the President's original request was not only deliberately vague and deceptive. It was a lie. Her initial demand was to be able to appropriate ANY private property, not any available private property. Any available private property includes occupied dwellings, cars, trucks, pencils, pens....ANY private property. Now she explains she actually wants any available land. Would it not be easier to have the Ministry of Lands Mines and Energy and CNDRA identify possible cemetery sites and purchase them from the owners? Would it not be safer to build crematoriums in each county / location, as Min. Lewis Brown said they already had plans to do? Based on her clarification the President wanted to appropriate private property, turn it into a cemetery, and then return the cemetery to the rightful owner. What "DAMAGE" would the government pay for. Does this President not understand that turning any land into a cemetery make that land UNUSABLE to the owner for any purpose? This explanation is so odious, and dishonest, it is not even worthy of any consideration. This was never about cemeteries. It was a flat out attempt to be able to dispossess citizens of any property the president and her minions identified and wanted, and deny them any judicial redress. There is no sane person, who believes turning vacant property into a cemetery and then returning it to the rightful owner, leaves the land usable for any other purpose. Congratulations Flomo Zayzay, the government has just returned your 25 acres and it is now a cemetary...enjoy! This lady continues to try to take Liberia down the road to perdition.